Hey guys! I'm sure you're all busy baking right now. I'm working on an apple pie and a fresh fruit tart. The pie gets a lattice crust like last time, and the pastry cream for the tart is chilling in the fridge. I hope it sets up properly! I also hope the tart crust bakes up and the sides don't collapse! That's all I'm making this time. I'll be posting picture updates to my Facebook page if you want to see a "live" stream of baking progress. What are you guys making? In case you need some inspiration, I'll post the links to Thanksgiving recipes I've blogged about in the past. Hope you are having a fun time baking! We're well into November! If you haven't started already, it's time to start preparing for your big Thanksgiving feast. You probably have a favorite recipe that you make every year, and chances are it's kind of rich. I know many of mine contain quite a bit of butter. Although they're full of flavor there is no denying that it's not the healthiest of meals. If you're not into all that richness and want to make your dinner healthier without sacrificing flavor, Unilever spreads are here to help. For this campaign, I was asked to replace the butter in two of my Thanksgiving recipes with one of Unilever's spreads, so I picked two recipes that used the most butter for this experiment. I chose Promise spread sticks because I saw that it contains omega 3s. According to Unilever's site, It Is Good To Know, their spreads contain 0% trans fat, has less cholesterol than butter, and no saturated fat. As for taste, Promise spread is pretty good as far as spreads go. It has a pleasant, sweet buttery flavor and doesn't taste like it's trying to be something it is not. A tablespoon of Promise is 80 calories, whereas butter is 100. It's not a significant difference, but it adds up. What is Thanksgiving without sweet potato casserole, am I right? It's practically a staple for many a Thanksgiving dinner. This particular recipe uses half a stick of butter which I replaced with a Promise spread stick. The cubed potatoes are cooked in a syrup consisting primarily of the spread and brown sugar. When tender, the potatoes are removed and the syrup is boiled until thickened. I wasn't sure if the additional water from the spread would affect this part of the recipe, but it didn't. It tasted just like usual, too. 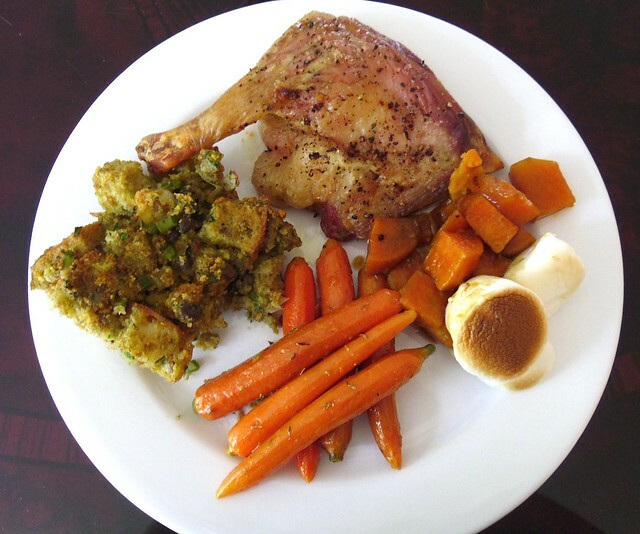 For my second recipe, I chose stuffing. I remember watching a chef on the CBS Early Show say that in order to make great stuffing, you need really good bread and a ton of butter. I got the good bread, and I got the Promise spread. The onions and celery are sauteed in a stick of Promise, then added to the dried bread cubes and cornbread crumbles. 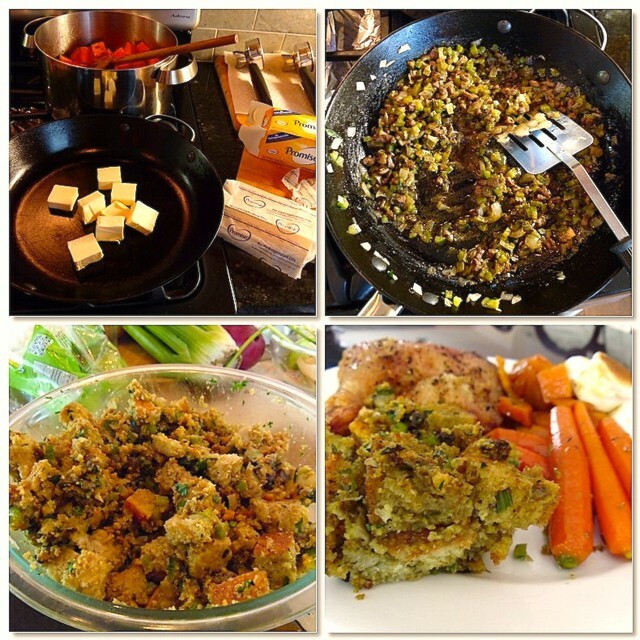 The stuffing (or did I really make 'dressing'?) was moist and flavorful. Another success! Overall, I didn't notice a significant difference in taste when using Promise. Although I don't shy away from butter by any means, it's nice to make at least a few dishes that aren't entirely unhealthy. If you'd like to try these recipes, click through to view and print. Promise spread sticks can be found in grocery stores and retails at $3.29 for a pound. Thank you to Good to Know & Unilever Spreads for being a sponsor. I was selected for this opportunity as a member of Clever Girls Collective. All opinions expressed here are my own. Melt Promise margarine in a large pot over medium-high heat. Add the sweet potatoes, brown sugar, salt, pepper, and water; bring to a simmer. Reduce the heat to medium, cover, and cook, stirring often, until the sweet potatoes are tender (a fork should pierce a cube with very little resistance), 45 to 60 minutes. Preheat oven to 350°. When the sweet potatoes are tender, use a slotted spoon to transfer the potatoes a greased 9-inch baking dish. Bring the sauce in the pot to a rapid simmer over medium-high heat. Continue simmering until sauce has reduced to a glaze, 7-10 minutes. 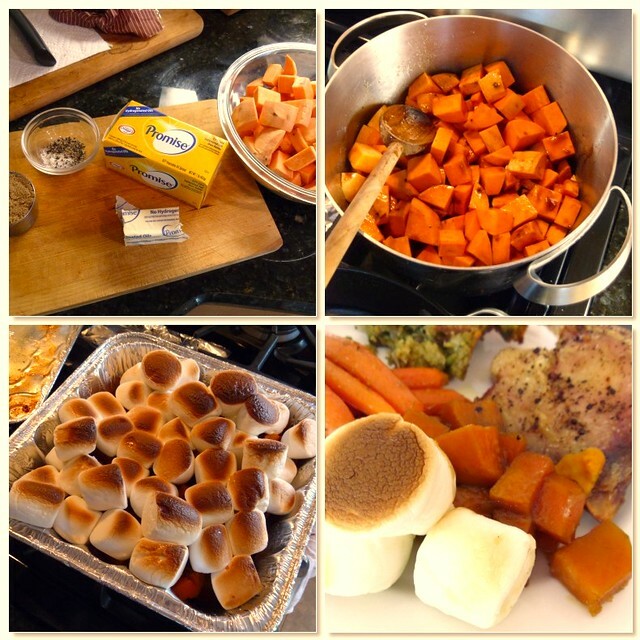 Pour over sweet potatoes in baking dish and top with marshmallows. Bake for 10 minutes. Turn broiler to high and continue baking until tops of marshmallows have browned and puffed. Remove from oven and serve immediately. Preheat oven to 325°. Spread bread cubes and crumbled cornbread onto a rimmed baking sheet and bake until dry, about 15 minutes. Cool on sheet, then transfer to a large bowl. Melt Promise spread in a large skillet over medium heat. Add onions, celery, and liver. Stir in salt and pepper. Cook, stirring occasionally, until softened, about 10 minutes. Remove from heat. Stir in sage and parsley. Transfer to bowl with crumbs and toss well. Stir in eggs and 2 cups broth, stirring until crumbs are evenly moistened. Add additional 1/2 cup liquid if necessary to achieve proper texture. Raise oven to 350°. Transfer stuffing to a buttered 9-inch baking dish. Bake for 35 minutes.